I had no idea he was harboring such sadness. We regularly talk about cancer and share how I am doing in age appropriate doses – it caught me off guard that he wasn’t comfortable talking about it himself. The tears led to a nice conversation about how it’s not something to be ashamed of or to hide from. It also reminds me that even when cancer is a part of every day like it has been for us since 2007, it isn’t easy for kids to understand or accept. He is scared. I am scared. It breaks my heart to watch him cry. As a mom you set out to protect your children – at all costs. 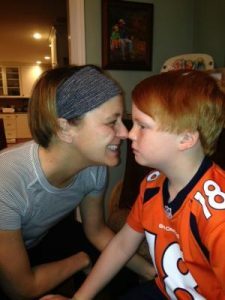 Bike helmets, car seats, parental controls on the ipad… Yet, here I am with metastatic breast cancer and I have the potential to cause him the most pain of his entire life. Watching his mom become sick and eventually die. The guilt and anger that comes from this thought is suffocating. How can I prepare him for this reality? How can I encourage him to talk about his feelings, to feel safe enough to share the sad parts of life with others? To accept? It’s unfair that moms like me have to think this way… that’s why I am so passionate about research. I hold out hope that I will be here long enough to see advances in science. And I too will focus on the happy parts. 8 years ago today I looked into the bright blue eyes of our second child – a healthy baby boy. I was so filled with joy and hope. Today I look into the eyes of a rambunctious, creative, caring, sporty 8 year old! Our little miracle. Our “chemo baby” we affectionately called him as we credited his bright red hair to the red chemo he and I endured 4 rounds of together before his birth. Today his bright red hair reflects his fiery personality as he enthusiastically declares breakfast for dinner as his birthday request! I stare at him thinking how 9 days after he was born I started back to chemo and 3 months later had a double mastectomy. The entire first year of his life I was in treatment. I couldn’t nurse or care for him on my own for long stretches of time. As his hair grew, so did mine. It wasn’t the way I pictured motherhood, but it was our story. And, we lived it to the fullest. Then, for 6 years – remission. Good health. Great health! But, cancer was always part of our vocabulary. A framed picture of us both bald- nose to nose hangs beside Bennett’s bed. He used to ask me to tell him the story of “when we were both bald” as he lay in bed “stalling” the good-night kiss. Both our boys knew I had cancer and that I created Hope Scarves to help others facing cancer. They heard me talk about cancer often. It was always behind us- a story of perseverance … with a happy ending. Until one day… when cancer invaded our life again. This time in the form of metastatic breast cancer. (which means cancer has spread beyond the breast. In my case, bones.) 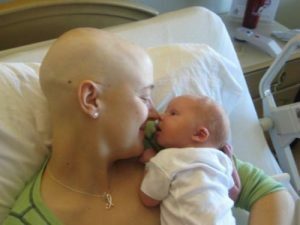 I looked into the eyes of that baby boy who never knew me before cancer. Whose whole life has happened since cancer. And, I realized that I couldn’t change the fact that I had metastatic breast cancer. I would continue to do everything I could to make my body, mind & spirit as healthy as possible. For him and his brother… for our family. I couldn’t change the fact that I was in the 30% for which cancer spreads beyond the breast… but I could determine how I faced it. And, so today, we celebrate Bennett’s 8th birthday! We also celebrate 8 years of normal, everyday life. Living life over cancer one day at a time. And we look to the future with hope. It’s hard at times. Overwhelming. I’d rather still be living the story with the happy ending- where we talk about cancer in the past tense. Instead we live with a much greater appreciation for how precious life is. We are thankful beyond words for the continued good response I have to my current treatment. Cancer doesn’t dominate our life. But, it is a very real part of it. Every day. The reality is hard as I watch others with metastatic breast cancer suffer. Today, my friend Shayne died – a single mom with two little ones. She didn’t see her son turn 8. She isn’t here to tuck him in tonight or fall for his bedtime stalling antics. I’m overcome with anger and disbelief that 115 women die of metastatic breast cancer every day and that we don’t more strongly align stage iv research to ribbons. It’s harder to celebrate in this reality of metastatic breast cancer. But, we do. Because we must. The celebrations are what we live for. And breakfast for dinner. Happy birthday Bennett. I love you with all my heart and all my soul. forever.